So, at long last, I'm able to announce my newest book! It's a bit of a depature from my Eli series, but I think we'll all agree I'm headed in the right direction! And so, without further ado, may I present: A NOVEL! 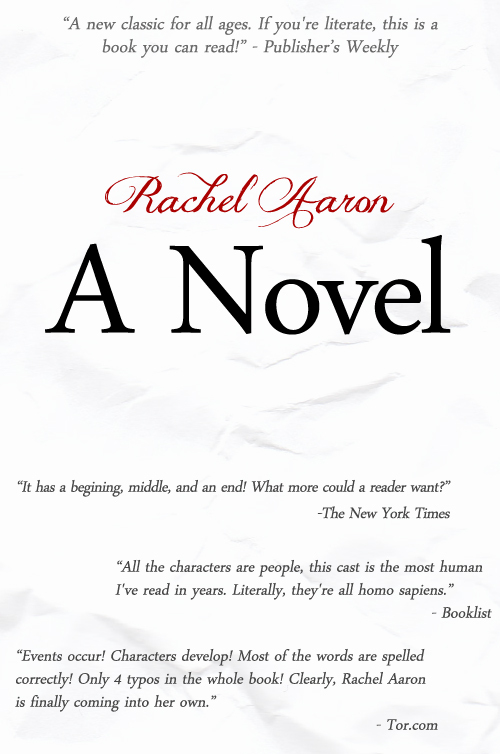 Presenting Rachel Aaron's newest work of fiction: A NOVEL. Jane is a woman with a motivation. To get what she wants, she'll have to take action... but can she? When complications arise, she'll have to team up with other named characters to finish the plot and maintain the narrative tension, or it's happily never after for everyone! I know it's been a long time, folks, but I swear A NOVEL is worth the wait! Look for it in bookstores everywhere at some date in the future which may or may not occur!